MORNING VIEW, Ky. — The Kenton County Fire District’s ambulance hasn’t left the garage since late June. It isn’t broken. The department simply can’t afford to pay the two qualified emergency medical technicians required by state law to deploy it. Until the Morning View-based fire department finds either more money or EMTs willing to work on a strictly volunteer basis, fellow fire departments from Independence, Fiskburg and Ryland Heights — each at least 15 minutes away — will take over ambulance duties. 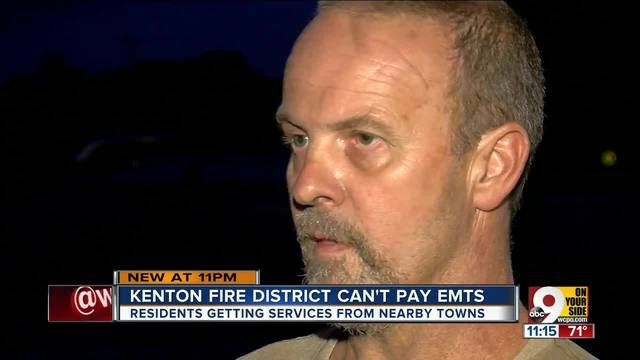 Independence fire Chief Scott Breeze said the problem comes from the Kenton County Fire District lacking a “robust tax base” that could pay for part-time EMTs to run the ambulance. Hopple’s department made 19 runs in the month leading up to Thursday. Eight of them were to places covered by the Kenton County Fire District. “It’s all part of helping each other out, but when you get their department coming over to help yours out, it takes away from their area,” Cheesman said. It isn’t a significant burden, but it also isn’t a permanent solution. The agreement between Kenton and the other three fire departments will last less than a year. Kenton firefighters hope their department will again be in good standing with the Kentucky Board of Emergency Medical Services and resume its own ambulance service by the time it expires.